In this tutorial you will see how to make a Login System with facebook using php and mysql. User will login with their facebook account, give permission to access basic profile, and their name with email will be stored in database if they are not stored before. Login with Facebook and creating Facebook App for Website. 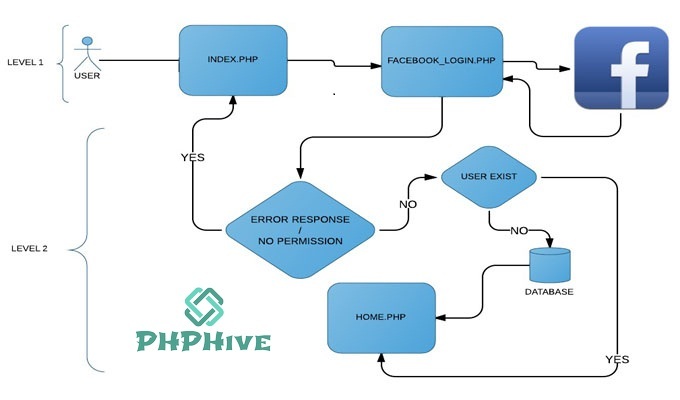 Given below is the workflow of the Facebook Login System with PHP and MySQL. Set your index.php with the login URL in the anchor tag. So when the user clicks on it it will be redirected to facebook site. User will login with their facebook accounts and give permission to the application. If user dont give permission then user will be redirected back to index page. If the user gives permission to the app then user information will be returned and data will be processed accordingly. Just the final step to display user the message based on database transaction i.e. if user has registered for the first time or logged in back with their facebook account. Contact Your Web Hosting Company for Enabling Curl ! why I’m not getting email address? ?